Posh boss Grant McCann on the touchline with Swansea manager Francesco Guidolin. Photo: Joe Dent/theposhcom. Rookie Peterborough United manager Grant McCann has received a Premier League boost ahead of tomorrow’s (August 27) big League One match at fierce rivals MK Dons. Posh go into the game at stadium:mk on the back of a humbling 3-1 English Football League Cup defeat at the hands of Swansea on Tuesday (August 23). Posh were 3-0 down at half-time to an understrength, yet still very slick, Swans outfit. Leonardo Da Silva Lopes scores for Posh against Swansea. Photo: Joe Dent/theposh.com. But McCann said: “I spoke to the Swansea coaching staff after the game and they were very complimentary about the way we played in the second half. They were impressed that we kept playing football and they told me to stick to those principles. “Swansea went through the leagues playing good football as we did ourselves so it can be done, Swansea were outstanding in the first-half of that game. They were very hard to play against so it was great to receive praise from their staff. “We will be up against another good footballing side again tomorrow and I can’t wait to see my team in action on a big pitch that should suit us and in front of the huge away following we always take to this fixture. “We’ve had some great battles with MK over the years. It’s always a great occasion and tomorrow will be no different. The teams have started the season in similar fashion in the league and the cup. Ben Alnwick is fit to return in goal for Posh at MK Dons. Photo: Joe Dent/theposh.com. “As soon as the Swansea game was over I was stressing to the players how important the MK Dons game is to the club and our fans. MK Dons will feel the same way so it’s important we stamp our authority on the game from the start. “We haven’t been starting games well, but the players know that so I won’t be mentioning it beforehand. “We will carry on playing our football. We have to play out from the back. We have the players who can do that and anyway there is no point in kicking it long as we have no-one suitable to kick it to! Cerntral defender Ryan Tafazolli will again be absent with a hamstring strain. Jack Baldwin is now free of suspension and likely to return as Michael Bostwick’s central defensive partner at the expense of Ricardo Santos. Tafazolli has been pencilled in for a return in the Checkatrade Trophy tie against Norwich City at the ABAX Stadium on Tuesday (August 30). Teenage midfielder Leo Da Silva is challenging Jermaine Anderson for his midfield starting place after scoring a spectacular senior goal in the Swansea defeat. Goalkeeper Ben Alnwick has recovered from the niggle that forced him out of the Swansea match at the last minute. He’s expected to return at the expense of veteran Mark Tyler for Posh’s first visit to the stadium;mk since a humiliating 3-0 League One defeat in February 2015, a result that heralded the departure of the most successful Posh manager of all time, Darren Ferguson. McCann watched that match with the away fans after a fall-out with Ferguson that led to a brief spell in Irish football with Linfield. He returned to Posh the following week. “What happened in the past, stays in the past,” McCann added. “My concern is all about playing well tomorrow. I’ve challenged the players to put on a performance we all know they are capable of. McCann doesn’t expect to see any new signings ahead of tomorrow’s match, but he has a list of potential targets ahead of Wednesday’s (August 31) transfer deadline. Posh have sold over 1,200 tickets for tomorrow’s match, but the game is not all-ticket and admission can be gained on the day. 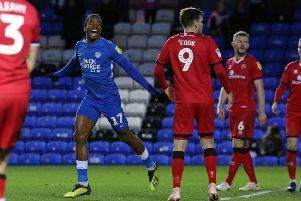 Posh follow the trip to MK Dons and the EFL Trophy tie with Norwich with two League One home matches against Swindon (September 3) and Port Vale (September 10). The Swindon game kicks off at 12.15pm and will be shown live on Sky TV.